Well, we just had an amazing investigation this past Sunday night in Philadelphia, PA. Kind of strange that half of the block we were on the night before burned down to the ground minus the investigation location. Very bizzare... We are still looking into this and will report back any findings that we can. Anywho, Chris and Erick will be appearing at Frontier Para Con 2012 this year at the Stanley Hotel in Estes Park, CO from May 4th - May 6th. 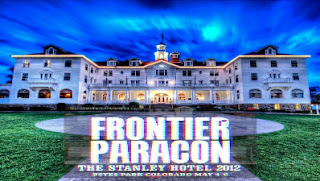 It's going to be an amazing paranormal event with lots of celebs, guest speakers, vendors, ghost hunts and much more. We will be lecturing from 2:00-2:30pm that Saturday afternoon. Going to be a blast! We recently heard that over 90% of the rooms are already booked for the event, so if you plan on attending, you may want to move as quickly as possible to secure your spot.